, printers, printing supplies and digital entertainment products. Cash Back is not available on gift card purchases, HP Parts Store purchases, high volume orders as defined by HP. HP defines high volume orders as more than 10 orders per month for any products by the same customer. Any orders placed after the 10th order will be canceled by HP. Orders which receive a free gift card will have the Cash Back eligible amount of order reduced by the amount of the free gift card. Cash Back is not available on printers, ink & toner, printheads & paper. Cash Back is only available for Laptops, desktops, all-in-ones, accessories and monitors. 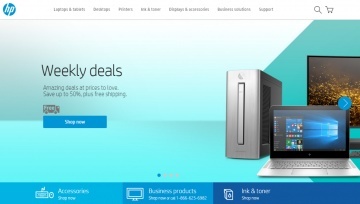 Click a Coupon or click Start Shopping to earn Up to 2% Cash Back at HP.